South Korean investors on Monday began to rush to stocks in business areas related to the production of face masks and the development of vaccines, after the recent return of Middle East respiratory syndrome. But foreign investors contributed little to the sharp upward trend in demand for these stocks. Upon market opening at 9 a.m., GeneOne Life Science, a Korean drugmaker known to have been pursuing development of a MERS vaccine; and Okong, a maker of adhesive products including disposable face masks, hit price ceilings and ended 30 percent higher than the previous trading day. GeneOne Life Science is trading on top-tier Kospi, whereas Okong is listed on second-tier Kosdaq. The price of stock in the Kosdaq-listed Paru, a solar tracker maker that also produces hand sanitizers, jumped 12.4 percent; while the Kosdaq-listed Welcron, a manufacturer of microfiber products that also makes protective masks, was 20.1 percent higher at closing. None of the four companies’ stocks were sold or purchased through foreign brokerage houses until after the close of the Monday session. Some of those stocks, however, saw their earlier gains disappear. The share price of Kospi-listed Ilyang Pharmaceutical, another developer of a MERS vaccine, was 9.3 percent higher early in the morning, but the gains from Monday’s trading shrank to 1.3 percent at closing. Kosdaq-listed Bioneer, which has developed a diagnostic kit for MERS, showed a similar pattern on the daily price chart to end 1.7 percent lower. Both stocks experienced net sell-offs by foreign investors. 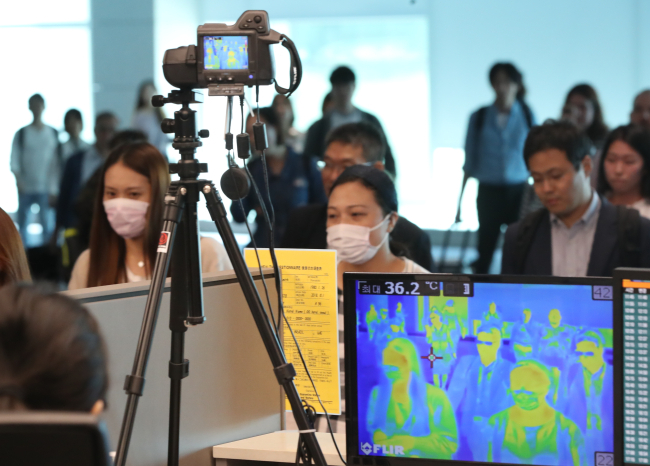 On Saturday, a 61-year-old Korean man who had flown back from Kuwait the previous day was diagnosed with MERS and is being treated at a hospital in Seoul, sparking nationwide concerns about the viral infection that led to 38 deaths in 2015.